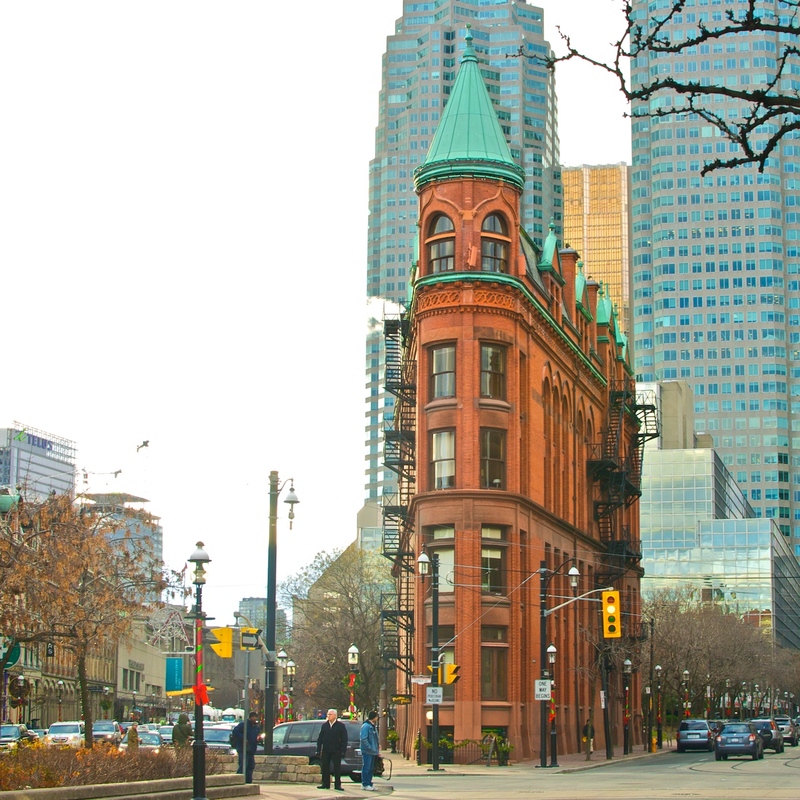 One of my favourite buildings in the city has to be the Gooderham (AKA the Flatiron Building) located at 49 Wellington Street East. Its incredible architectural design and colour has drawn me to its corner on more than one occasion, but since I've been unsuccessful finding someone fashionable to shoot in front of the building, I resorted to bringing a fashionable person to the building instead. Introducing Chantelle S. White. Chantelle is wearing a full-length vintage fox coat, which she had altered to a vest, Wolford stockings (opaque Navy) -- custom tattered herself, Tory Burch boots, vintage dress and blouse and lamb tassel bag. She fashioned this inspiring look after shopping at second-hand stores and boutiques located in both Toronto and Manhattan. "I gravitate to the elegance of fur," Chantelle shares. "Miss Anida Perona removed the sleeves and restructured its silhouette. A full-length fur offers complete protection from winter's icy grip while depicting a chic, polished persona. A vest allows for avant-garde flare at any time of the day. It only seemed natural to me that a hybrid piece would be the ultimate creation." "I had the great fortune of launching my career in an extremely innovative and entrepreneurial field -- digital media. In 2006, my profession relocated me to Manhattan, NY. " "I always have a creative and eccentric spirit when it comes to my attire. In Toronto, conservatives were quick to notice my art but seldom appreciated it. I found Manhattan is an island of misfits but of the highest caliber. These non-conformists were innate achievers, valedictorians in their chosen field and possess the fortitude to attain their goals with the self-awareness to pave their own path. "With full conviction, I believe it is for these reasons that Manhattan is considered a global Fashion capital. The true depiction of style is innovation: fabric textures, construction of garment and overall presentation. The art of fashion is recognized as style. "When drawing a comparison, the creativity of Torontonians is epic but it is Manhattan's vast number of artistic nonconformists that acts as the differentiator. New York's unconventional populace supercedes the conservative allowing for the streets to dub as catwalks and the art of fashion to prevail." "Our sprint into this global economy only strengthens our individual need for distinctiveness. The boarders will become greyer lines and cultures will continue to amalgamate while redefining our geography and style."